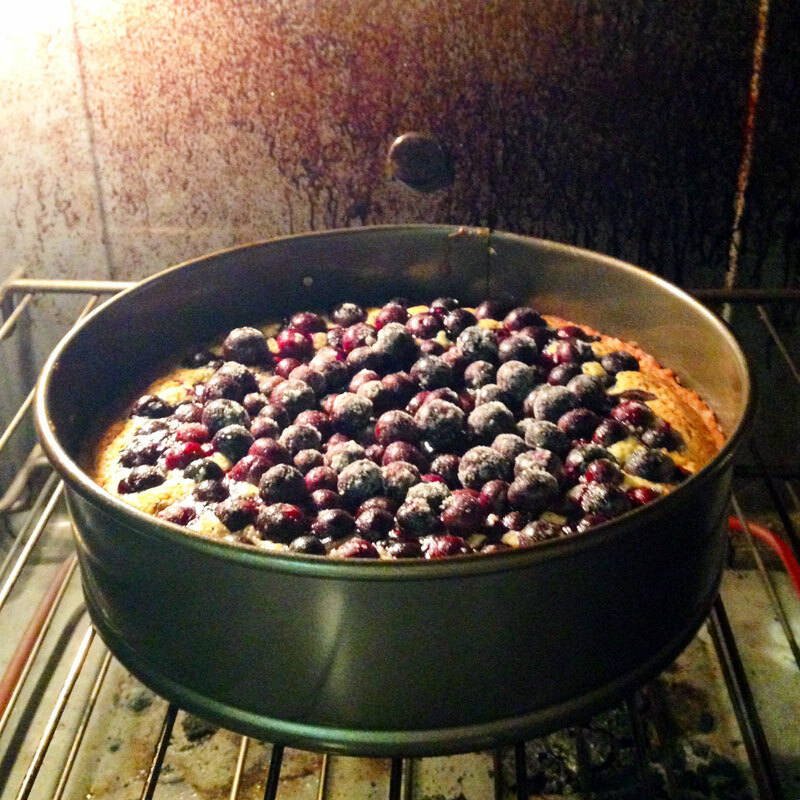 Alice Waters’ Blueberry and Poppyseed Butter Cake! A favourite cake of my father’s is a poppyseed angel food cake, and when I was growing up, my mother would bake one annually for his birthday. I have fond memories of the dessert, often glazed in a thin and not too sweet chocolate icing. The tiny black seeds are thusly associated in my mind to a kind of celebratory luxury. From The Believer, a great article by C.S. Leigh on the way cinema is evolving. With the decline of movie theatre attendance, and a move towards digital viewing on ever more portable devices, the time when a viewer was trapped in a nearly one-on-one dialogue with a film is fading away. We can now pause, rewind, skip ahead, and sometimes altogether ignore a movie. We can perform other tasks, like texting or surfing the internet while “watching” a movie – moving our attention back and forth from the screen. The power of a film/filmmaker to hold our attention, and thusly, to physically activate our viewing experience is drained from this contemporary form of viewership. We no longer have to sit through the full 484 minutes of Andy Warhol’s “Empire” (that anyone would ever want to is beside the point) or even Michael Snow’s less lengthy, 45 minute “Wavelength”, we can simply throw it on in the background or catch the highlights on YouTube. Be sure to read to the end of the article, where Leigh lays out a hilarious example of when cell phones meet black & white films from the 60’s in an Atom Egoyan short. “You could also have a very different relationship with a film depending on where and with whom you watched it. An audience at a university cinema in L.A. had a solemn, nearly funereal reaction to Pasolini’s Salò, based on Sade’s 120 Days of Sodom (they seemed uncertain whether they had just witnessed a film or a crime); later, I watched the same film at the Accattone in Paris with an audience that couldn’t stop laughing. Practice. Experiential. Performance. Happening. Research. Based on. Politics. Place. Political. Investigation. Series. Way in which. Developed. Civic space. Art. Work. Provide. Experience. Visual. Problematized. Created. Elements. Experience. Senses. Images. Sense. In the case of. At this time. Information. Access the work. Documenta. Cocking a gun. Great success. Sold. Museum. Press. Disappointed. Conversation. Create. Experience. Space for discussion. Given. Deliver. Work. Engage. Commitment. Separate. Art world. Social timing. Visualization. Unstable. Renegotiation. Status. Statement. Body art. In a way. Agreement. Legal. Negotiate. Timing. Document. Imagination. Institution. Outside. Providers. Privileges. Capsule. Dressed. Surrounding. Symbol. Interesting. High profile. Curators. Weird, but not weird enough. Oh, this is art. Events. Public space. Strategies. Impacts. Project. Encounter. Workshop. Announcement. Situation. Show. Camera. Invite. Discussion. Event. Opening. Enter. Monkeys. Eagles. Problematic. Solve. Useful. Symbolically effective. Actual. Solve. Re-stage. Areas. Manifestation. Revolt. Techniques. Museums. Situation. Not artists. Performance. Sold. Transform. Liberated. Economically. Persecution. Denouncing. Liberation. Equality. Liberate. Equal. Co-creator. Highly politicized. Audience. Space for discussion. Enter. Aspects. Not so comfortable. Political art. Preconceptions. Duties. Approaching. Uncomfortable. Panel discussion. Conflict. Aspect. Actually. Control. Social spaces. Preconception. Unresolved. Play a lot with memory. Authorship. Authority. Distribution. Capitalism. Planted. Attack. Gagosian. Obrist. Wirth. Zwirner. Lowry. Curiger. Serota. Broad. Goldberg. Pinault. Weinberg. Deitch. Weiwei. Gund. Pacquement. Vidokle, Aranda & Wood. Nauman. Glimcher. Ruf. Lévy & Mnuchin. Blazwick. Goodman. Spiegler & Schönholzer. Gladstone. Jopling. Kelley. Sherman. Joannou. West. Brown. Fischli & Weiss. Cohen. Blum & Poe. Pasternak. Abramovic. Arnault. Pinchuk. López. Murakami. de Cisneros. Slotover & Sharp. Enwezor. Higgs. Sehgal. Hoffmann. Sprüth & Magers. Koons. Logsdail. Coles. Gorvy & Cappellazzo. Meyer & Westphal. Philbin. Hirst. Perrotin. Richter. Bourriaud. Marks. Kittelmann. Ringier. König. Buchholz. Kapoor. Birnbaum. Webster. Christov-Bakargiev. Boros & Lohmann. Celant. Cattelan. Rauch. Groys. de Alvear. Ropac. Rugoff. Miro. Saltz. Zabludowicz & Zabludowicz. De Carlo. Paley. Peel & Gertler. Smith. Saatchi. Neuger & Riemschneider. Cristiani, Fiaschi & Rigillo. König. Schneider. Tsong-zung & Hsu. Daskalopoulos. 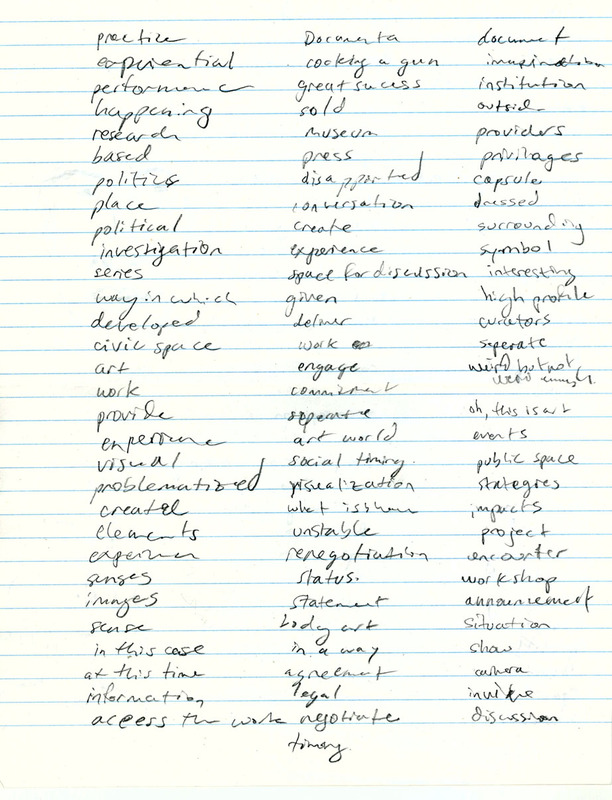 Tiravanija. Tillmans. Hoor Al-Qasimi & Persekian. Gioni. Renfrew. Wallner. Kalmár. Tohme. Podnar. Dee. Chang. Bruce High Quality Foundation. Heller. That which I was responding to. Didactic. Process. Speaks to. Information. Material. Experience. Embodied. Installation. Laying. Projection. Space. Reverie. Engages. Opens-up. Image. Appearing. Ground. Points. Reversed. Systems. Comprehend. External. Viewer. Construct. Building. Twinkling. Sensual. Calculated. Discernible. Direct. Rupture. Formulated. Proposing. Activity. Quantitative. Shift. Status quo. Describes. Pragmatic. Gesture. Programmatic. Proposal. Work. Materiality. Social structures. Reaction. Rules. Object. Visitor. Person. Formulated. Basic. Repopularised. Template. Formally. Organized. Chaotic. Unstructured. Interested. Aesthetic. Motifs. Chosen. The way that. At some point. Reading. Nonsensical. Passage of time. Simply. Artifact. Forgery. Contemporary. Render. Suggests. Documents. Sort of like. Very much. Defined objects. Questionable. Process. Redrawing. Abstract. Marks. Undefined. Remembering. Imperfection. Studio. Midnight. Dropped. Beer. Latest work. Hand-rendered. Fluorescent. Apocalyptic. Heavy metal. Expertly executed. Expressions. Suburban. Diverted. Adjacent. Jam. Rockers. Amplifiers. Steven Shearer. Remarkable. Facility. Virtuosity. Ability. Magical. Mastered. Craft. Adolescence. Basement. Stardom. Draw. Ultimatum. Art school. Reputation. Geometry. Notions. Expressivity. Figurative. Produced. Bodies of work. Indisputable. Ideologically. Enlightenment. Modernism. Construction. Fitted. Derived. Suggest. Activity. Pursue. Aesthetic. Ethos. Module. Problem. Structures. Affect. Sublimation. Primitive. At odds with. Invokes. Figure. Youth. Rebellious spirit. Modification. Autonomous. Naively utopian. Cynical capitulation. Exhibited. Collectively. Minimalism. Pop Realism. Andy Warhol. Affirmative. Consumers. Gleaned. Iconic. Feminized. Pubescent. Portraits. Dubious. Text-only. Interpreted. Presentations. Self-portraits. Confusion. Richard Prince. Re-victimizing. Subjects. Relation. Identification. Negotiate. Pioneered. Rauschenberg. Cady Noland. Sloppy registration. Precise. Mechanical reproduction. Sigmar Polke. Richard Prince. Martin Kippenberger. Ostensibly. Picasso. Paradigmatic. Canvas. Grainy. Substrate. Jackson Pollock. Cathartic. Death metal. Prefab. Frenetic. Series. Research. Heat-laminated. Monochrome ground. Snapshots. Proletarian. Symbols. Appropriating. Violation. Emblematic. Referencing. Lumpen. Formal. Documentary. Unresolved. Caravaggio. Sacred. High modernism. Autobiographical. Anthropological. Gerhard Richter. Ruse. Beaux-arts. Composition. Affectation. here’s a few blogs i’ve recently been made aware of. the first is my friend Jacquelyn’s blog, Music That Resonates. it’s a music blog, and Jacquelyn’s definitely the person to go to for info on new and interesting music. she was the music supervisor on my short film, The Gesture, and is the head of music licensing at Core Music Agency. the second is the blog of a new friend of mine (who I met through Jacquelyn), Kate, and it’s called Lady Business. supposedly it started out as a forum for Kate to express her thoughts on feminism, and has expanded to include many of her other interests. she’s also a photographer and the site allows her to showcase her work. thirdly and finally is the blog for the gallery i’m currently employed at, Winsor Gallery. the blog is a way for the gallery to showcase its artists’ accomplishments and publicize events and goings on that are of interest to us. example: one of our new artists, Vancouver based Fiona Ackerman, just had her work in the yearly art sale, The Cheaper Show (all art, $200! = the cheaper show!) and was showcased with an interview in The Block, an online magazine.